With the aim to enable stakeholders to steer and support sensitive adaptive management process in conflict situations, the Fourth Landscape Learning Journey (LLJ4) took place in the Gambella Region, Ethiopia from the 8th to 12th of May 2017. Landscape facilitators from Djibouti, Kenya, Sudan, South Sudan, Somalia/Somaliland, and Ethiopia participated in the event. Taking place under the theme, “Adaptive Management in Turbulent Contexts,” the training brought together 26 facilitators, researchers, and policy and decision makers from the Horn of Africa Climate Change Programme (HoA-CCP) to explore alternative ways to meet landscape resource management objectives. The event was an opportunity for the stakeholders to discuss a range of management options in turbulent contexts and conflict management approaches. This was informed by a situation of land-based development challenges in the Gambella Region. Participants were introduced to the tools required to analyse the causes and stages of conflict and familiarized with conflict negotiation and mediation skills. The learning event was steered by four facilitators from the Netherlands. The Dean of Natural Resources Department at Gambella University represented the university at LLJ4. 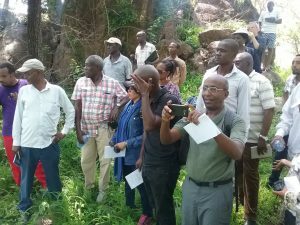 As part of the training, participants toured the Gambella Eco-Hub and the surrounding community to learn about permaculture activities and the potential for sustainable food production. They also obtained lessons on strengthening local livelihoods, including site planning and opportunity for community involvement. Under the HoA-CCP, the Gambella Eco-hub serves as a climate smart learning hub for best land-management and agricultural practices.